AOML's Physical Oceanography Division, the Caribbean Coastal Ocean Observing System (CARICOOS), and NOAA's Integrated Ocean Observing System (IOOS) are leading a multi-institutional effort that brings together the research and operational components within NOAA and the university community to implement and carry out sustained and targeted ocean observations from underwater gliders in the Caribbean Sea and southwestern tropical North Atlantic Ocean. The upper ocean thermal structure in this region has been linked to rapid intensification of tropical cyclones, and to the seasonal Atlantic hurricane activity. However, there are only few (<300) upper ocean thermal observations carried out per year in this region. The work carried out by this project provides between 6,000-10,000 profile observations of each observed parameter (e.g temperature, salinity, dissolved oxygen, chlorophyll concentration). AOML-CARICOOS Underwater Gliders are officially part of the NOAA Hurricane Research Division tropical Atlantic Hurricane Field Program. The red lines indicate the approximate track of the upcoming deployments on the week of July 14, 2014. Tracks of Cat. 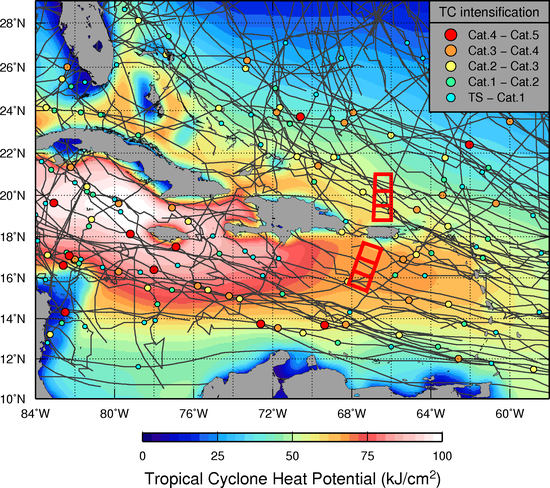 1-5 cyclones (in grey) in a region of the Atlantic Warm Pool during 1993-2011, with circles indicating the location of their intensification. The background color is the Tropical Cyclone Heat Potential (proportional to the upper ocean heat content). For additional information about this project please contact Dr. Gustavo Goni. Dong, J.,R. Domingues, G. Goni, G. Halliwell, H.-S. Kim, S.-K. Lee, M. Mehari, F. Bringas, J. Morell, and L. Pomales, 2017: Impact of assimilating underwater glider data on Hurricane Gonzalo (2014) forecast. Weather and Forecasting, 32(3):1143-1159, (doi:10.1175/WAF-D-16-0182.1). Goni, G. J., R. E. Todd, S. R. Jayne, G. Halliwell, S. Glenn, J. Dong, R. Curry, R. Domingues, F. Bringas, L. Centurioni, S. F. DiMarco, T. Miles, J. Morell, L. Pomales, H.-S. Kim, P. E. Robbins, G. G. Gawarkiewicz, J. Wilkin, J. Heiderich, B. Baltes, J. J. Cione, G. Seroka, K. Knee, and E. R. Sanabia, 2017: Autonomous and Lagrangian Ocean Observations for Atlantic Tropical Cyclone Studies and Forecasts. Journal of the Oceanography Society, 30(2):85-95, (doi:10.5670/oceanog.2017.227). Domingues, R ., G. Goni, F. Bringas, S.-K. Lee, H-S Kim, G. Halliwell, J. Dong, J. Morell, and L. Pomales, 2015: Upper ocean response to Hurricane Gonzalo (2014): Salinity effects revealed by sustained and targeted observations from underwater gliders. Geophys. Res. Lett., 42(17):7131-7138, (doi:10.1002/2015GL065378). 11/01/2017 - Missions 15, 16 and 17 Start: The three gliders (SG610, SG630, and SG635) were successfully recovered marking the completion of the 2017 NOAA/AOML Hurricane Underwater Glider Deployment. 03/07/2017 - Missions 13 and 14 Starts: Two gliders (SG610 and SG630) were deployed in the Caribbean Sea. 11/10/2016 - Missions 9, 10, 11 and 12 Completed: Two gliders (SG609 and SG630) were successfully recovered in the Caribbean Sea on November 10, 2016. The recovery marks the successful completion of AOML's fifth underwater glider mission during the 2016 Hurricane Season. 11/02/2016 - Gliders SG547 and SG610 recovered: Two gliders (SG547 and SG610) were successfully recovered in the North Atlantic on November 2d, 2016. 07/22/2016 - Missions 9, 10, 11 and 12 Starts: Two gliders (SG609 and SG630) were successfully deployed in the Caribbean Sea on June 21, 2016. The deployment marks the beginning of the 2016 Atlantic Hurricane Season deployment. Two more gliders are expected to be deployed in the tropical North Atlantic as part of the Hurricane season operations. AOML-CARICOOS Underwater Gliders are officially part of the NOAA Hurricane Research Division tropical Atlantic Hurricane Field Program. 06/04/2016 - Missions 7 and 8 Completed: Mission successfully completed on June 2, 2016. Over 1,500 profile observations were collected in the Caribbean Sea during this mission. 03/11/2016 - Missions 7 and 8 Starts: Two gliders (SG609 and SG617) were in the Caribbean Sea on March 10, 2016. Gliders are expected to be recovered late May. 11/18/2015 - Underwater gliders recovered: Both underwater gliders, SG609 and SG10, were recovered on the Caribbean Sea and Tropical North Atlantic after the successful completion of the hurricane season underwater glider mission. During these missions, over 2,600 temperature, salinity, and dissolved oxygen profiles were collected. 08/11/2015 - Science highlight: In a recent manuscript by Domingues et al. (2015), observations collected by glider SG609 before, during, and after the passage of Hurricane Gonzalo (2014) were analyzed to improve our understanding of the upper ocean response to hurricane winds. this study is that salinity potentially played an important role on changes observed in the upper ocean; a near-surface barrier layer likely suppressed the hurricane-induced upper ocean cooling, leading to smaller than expected temperature changes. Additional details can be found here [pdf]. 07/15/2015 - Hurricane Season Glider Missions starts: Two underwater gliders, SG609 and SG10, have been successfully deployed on the Caribbean Sea and Tropical North Atlantic, marking the start of the hurricane underwater glider mission (Missions 5 and 6). Near-real time location of the gliders and plots of latest observations can be found here. 04/27/2015 - Underwater gliders recovered: Both underwater gliders, SG609 and SG10, have been successfully recovered on the Caribbean Sea on April 27. This completes Missions 3 and 4 after the collection of over 2,000 (two thousand) temperature, salinity, and dissolved oxygen profiles. 02/06/2015 - Underwater gliders deployed: Both underwater gliders, SG609 and SG10, have been successfully deployed on the Caribbean Sea on February 6, marking the start of Missions 3 and 4. For these missions, a new sensor to measure dissolved oxygen concentration was installed on both gliders. Near-real time location of the gliders and plots of latest observations can be found here. 11/20/2014 - Underwater gliders recovered: Both underwater gliders, SG609 and SG10, have been successfully recovered on the North Atlantic Ocean and Caribbean Sea on November 18, and November 19, respectively. The recovery marks the completion of Missions 1 and 2, with over 2,800 temperature and salinity profiles collected. 07/20/2014 - Underwater gliders deployed: Two underwater gliders have been successfully deployed off from Puerto Rico, marking the start of Missions 1 and 2. The glider SG610 has been deployed in the Caribbean Sea on July 14, 2014, while the glider SG609 has been deployed on the North Atlantic Ocean on July 19, 2014. Near-real time location of the gliders and latest temperature and salinity observations can be found here. 03/25/2014 - 1st Underwater Gliders Working Group Meeting: The first project meeting took place at AOML on March 25, 2014. The meeting addressed operational components of the project. Basic instructions on the deployment and recovery strategies have been provided to project members during a sea trial on March 26, 2014.